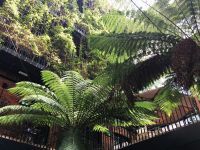 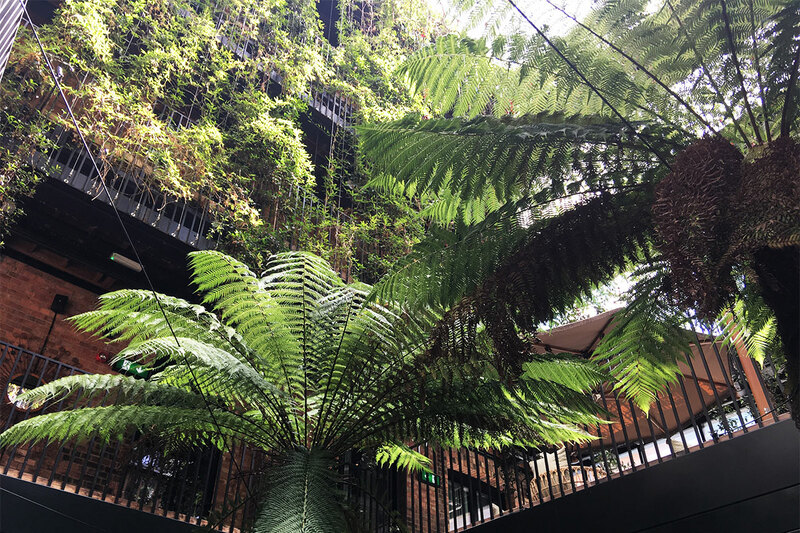 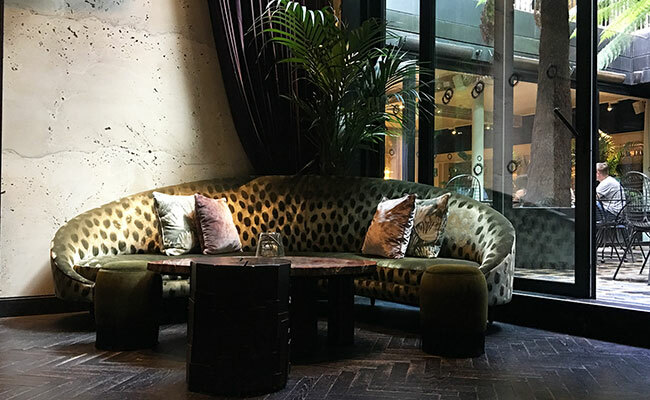 Situated in a fashion forward Mandrake hotel, Serge et le Phoque is stylish, eclectic and plant-tastic restaurant. 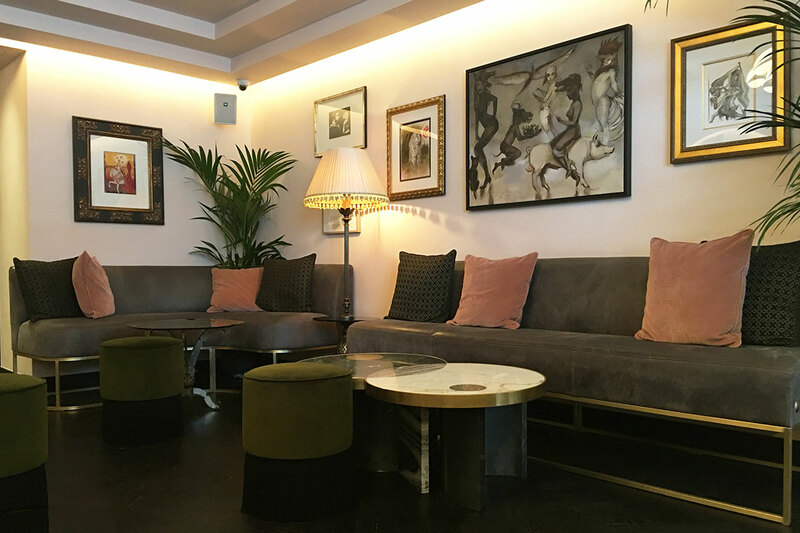 The façade of the hotel is quintessentially London but at ground floor behind a glazed window is the unmistakably quirky taxidermy beast that gives a hint of what to expect inside the Mandrake Hotel. 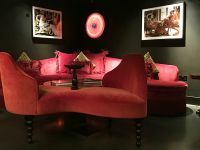 Controversial enough being made through taxidermy it would easily make the final cut in a J. K. Rowling novel. 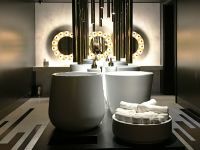 The unique creature is a result of many animals combined onto a recognisable ostrich body and we found it quite stunning in its final elongated pose. 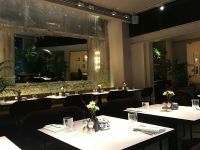 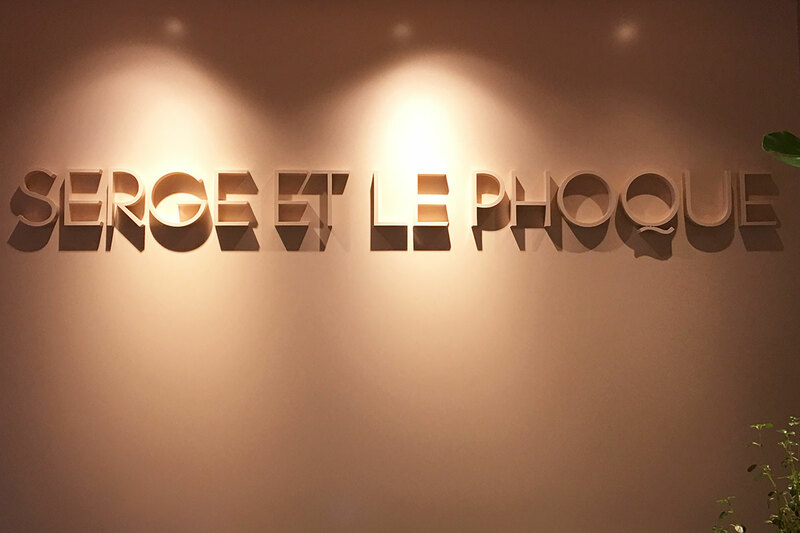 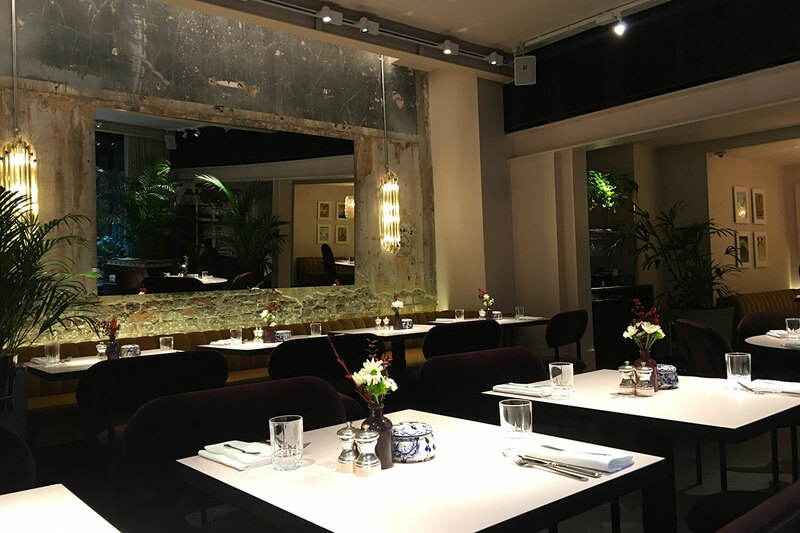 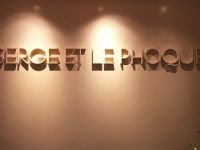 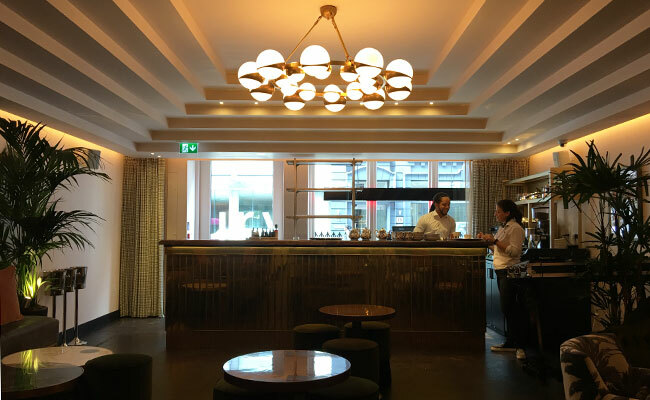 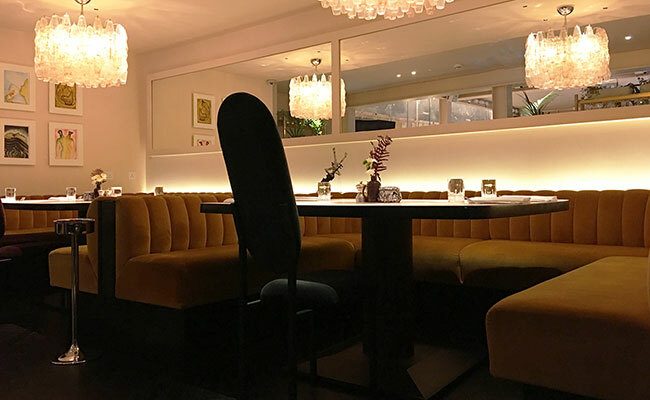 Serge et le Phoque is the hotel restaurant from the team behind the Michelin-starred sister restaurant of the same name in Hong Kong, and this is their first London venue. 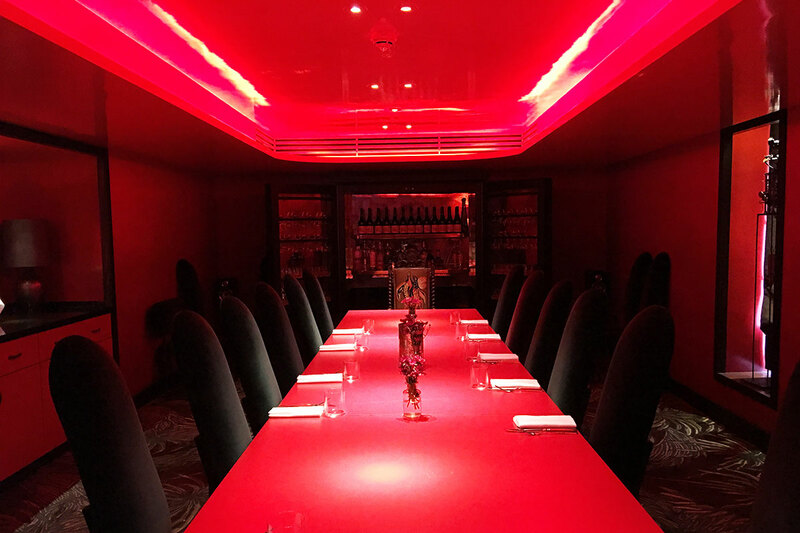 The 80 cover restaurant boasts a pale pink reception and bar and even features a DJ on weekends. 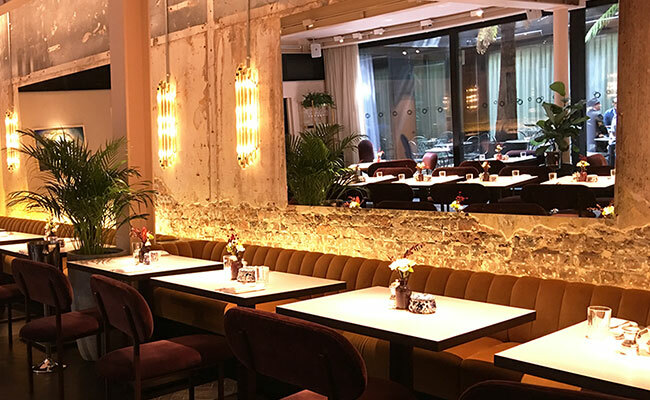 Hotel designers have created a main restaurant of exposed brick and plaster finish shell and the steel columns have been painted off white to match the ceiling boards. 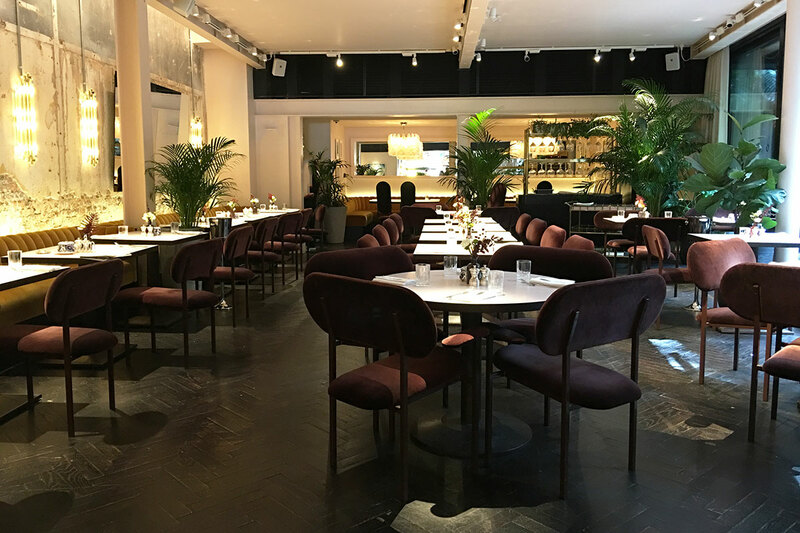 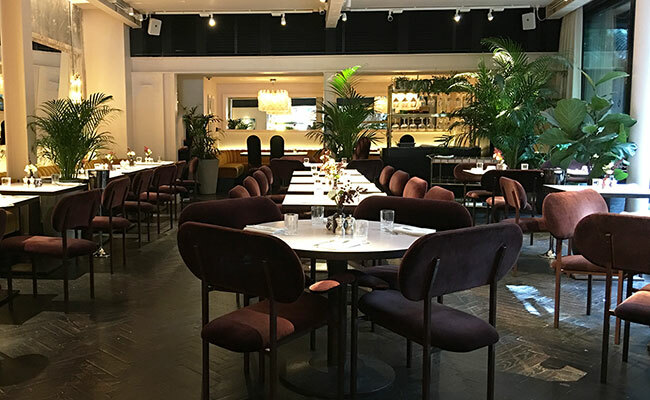 Diners sit opposite each other on bespoke chairs in plum velvet and although comfortable they have wide backs it must make service more difficult for staff. 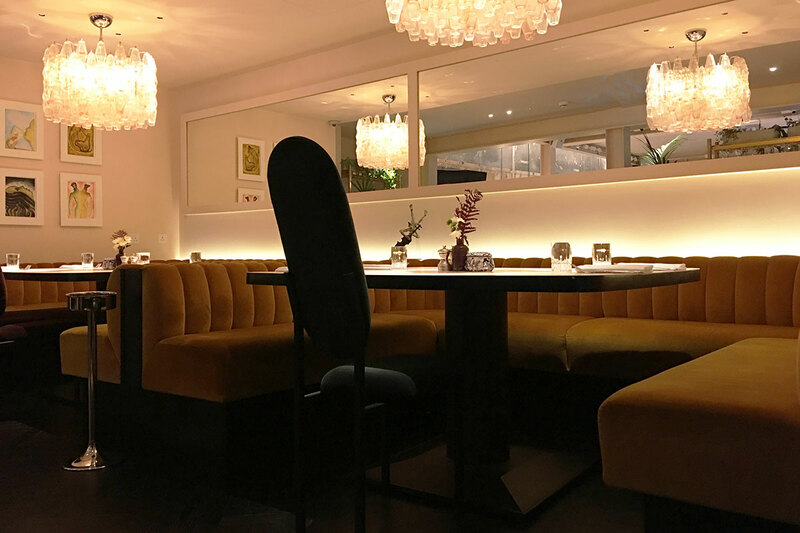 The banquette seating along the long walls are fully upholstered in a mustard/gold velvet with low fluted backs and concealed uplighting. 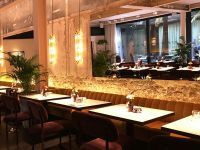 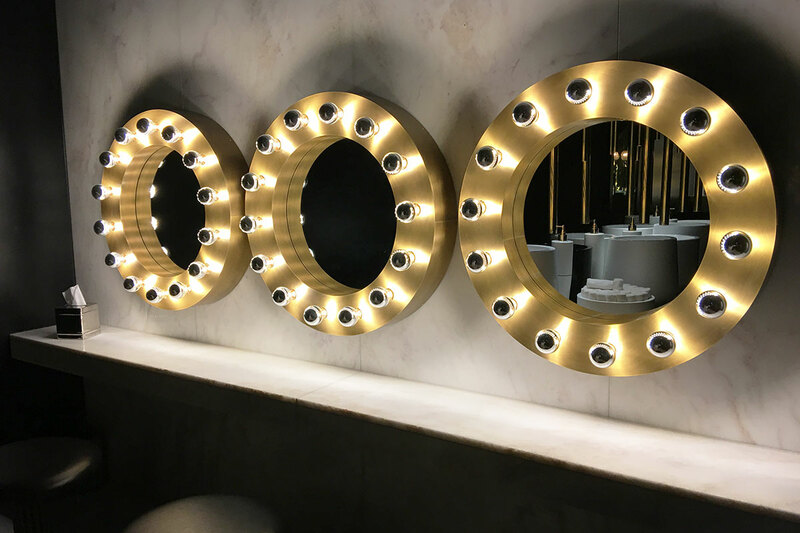 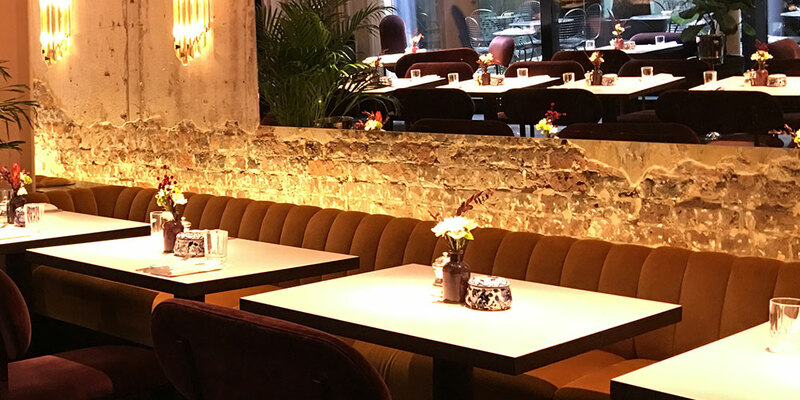 These combine with the tall tropical potted plants, art pieces, mirrors and reeded brass and glass wall lights to enhance and elevate the restaurant’s raw shell interior. 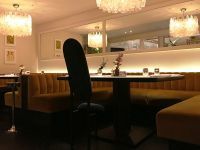 The dining table tops are a white laminate finish which is a practical modern surface we didn’t expect to find in a 5 star hotel restaurant. 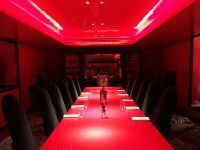 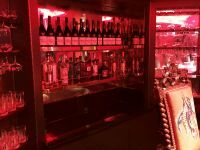 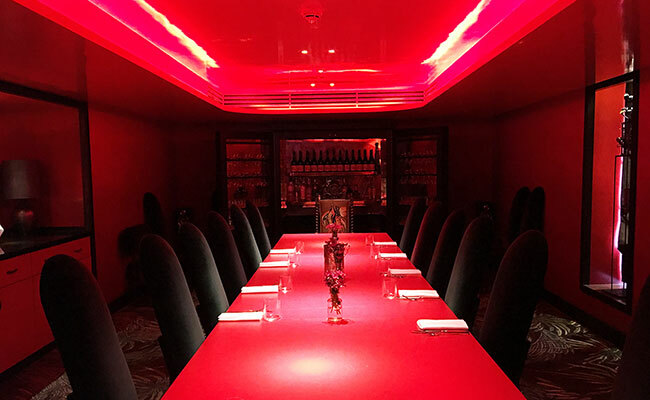 The 16-person private dining room bathed in red lighting, red laminate central table top with tropical palm frond patterned carpet is a far cry from the tastefully subdued main restaurant space. 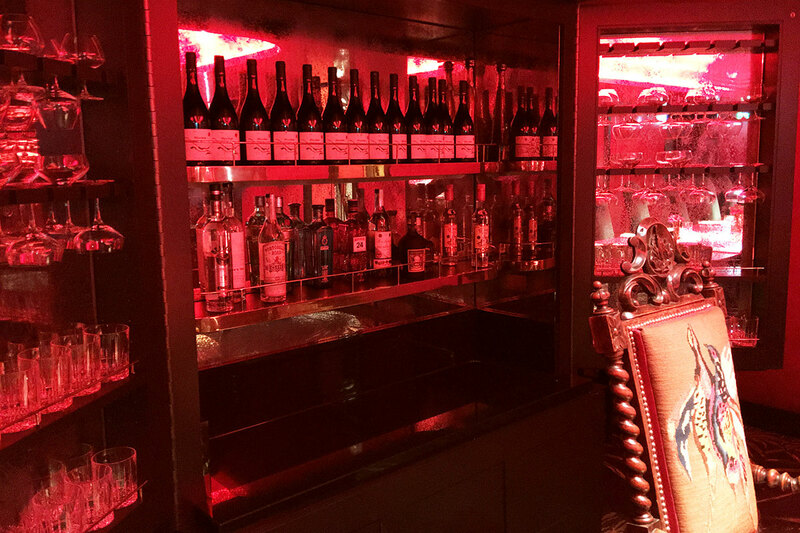 The full height stocked drinks cabinet at the far end is left open and indicates this room is more suited to the wealthy. 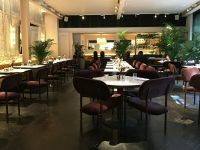 Modern pill shaped upholstered chairs similar to the restaurant chairs style have been separated by 17th century antique turned wood chairs with unique tapestry backs which add to the room decoration. 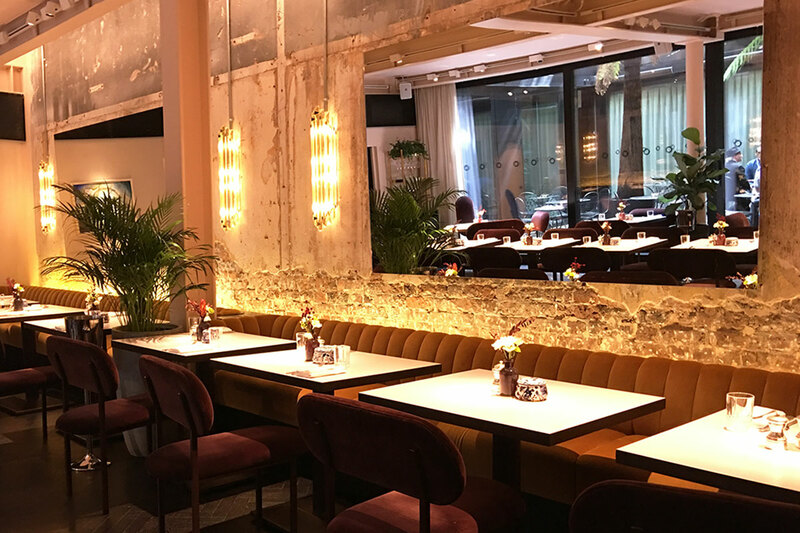 Fumed oak herringbone flooring extends throughout including the separate restaurant bar area which has more of an art deco feel to its furnishings and ceiling features. 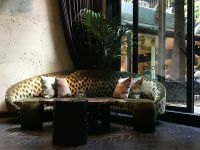 Dusky rose, greys and greens in soft velvet upholstery have been used alongside brass trims and unique green and white inlaid marble tables. 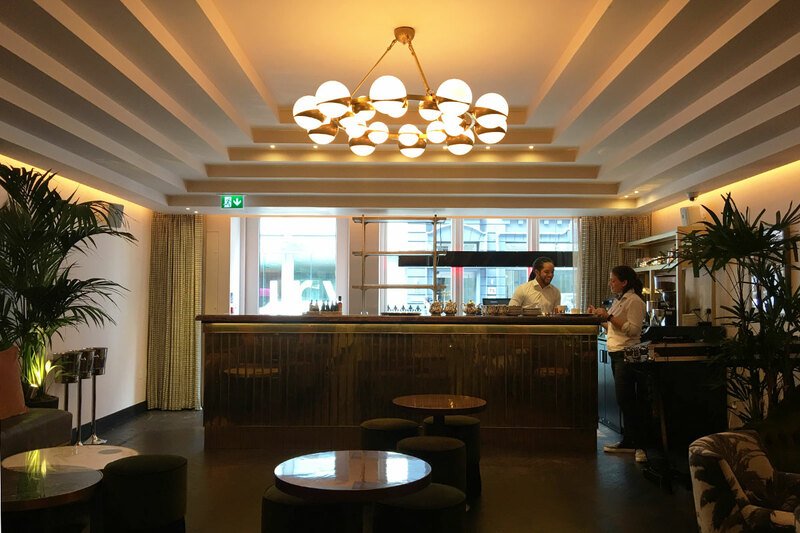 Below the front bar the polished vertical brass strips create movement when entering the space and the position of the bar acts as a divide between the seating area and the pavement. 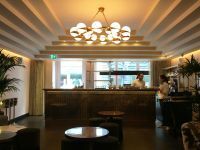 A quick ride in the hotel lift to the basement is where the washrooms are located. 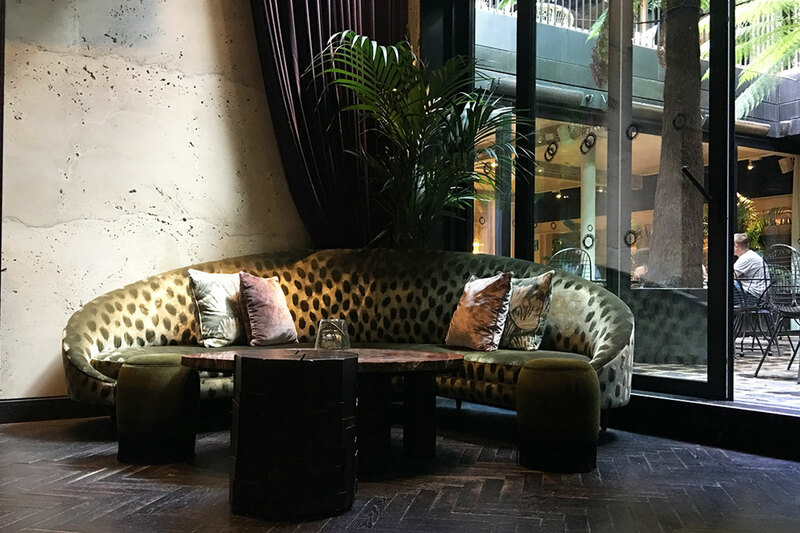 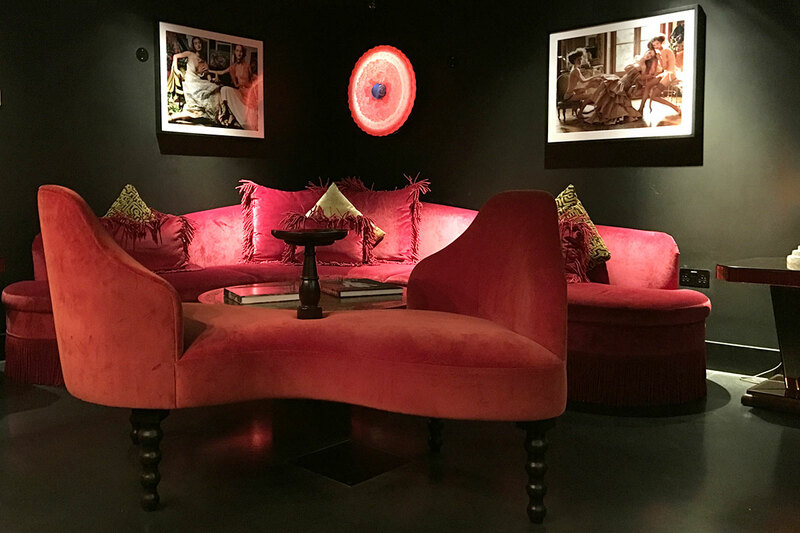 Immediately off the elevator arrive in the bold anteroom with opulent scarlet upholstered sofas and chaise and the colourful artwork stands off from the black walls and floor. 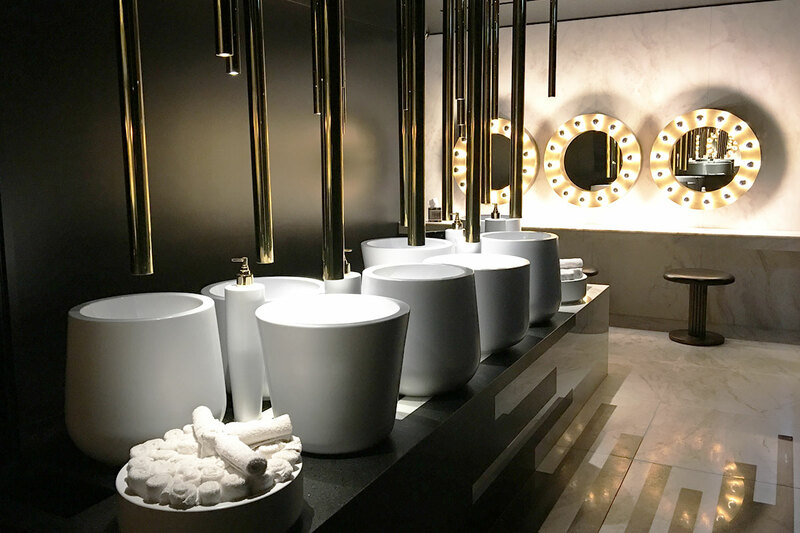 Beyond this lies the unisex washroom lobby which is a must see monochromatic explosion. 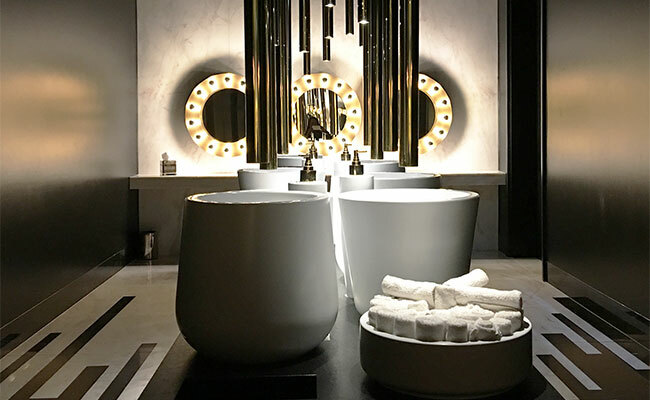 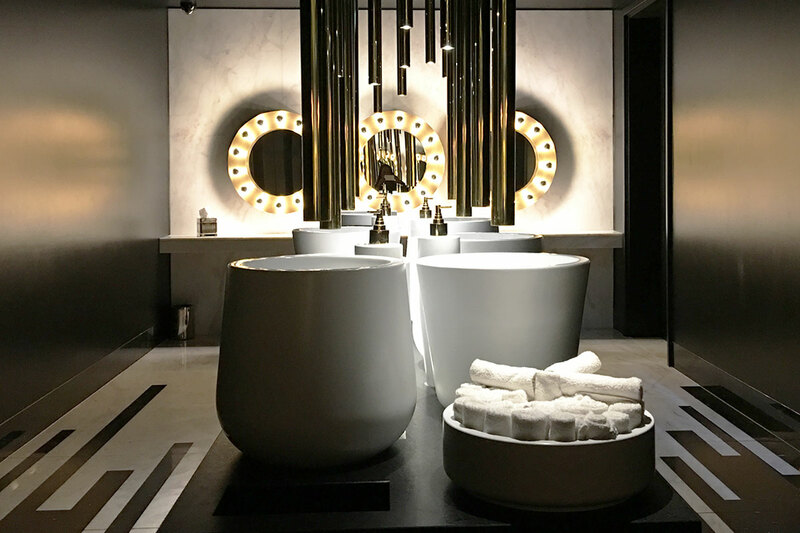 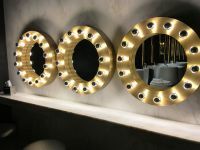 Black and white stone tiles, ceramic ware and long brass pipes suspended from the ceiling in the centre of the room can be best viewed from the seating bench under the mirrored arch, and if you need to re-apply any make-up there are three round illuminated Hollywood mirrors and stools at the opposite end. 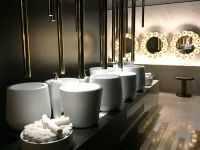 Male and female cubicles are separated and once inside you’ll notice the dark and moody lighting in a fully black interior, so much so it is difficult to differentiate between walls, floor and ceiling as they are all black, even the sanitary ware. 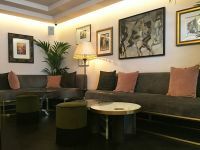 Situated in Fitzrovia the hotel is perfectly placed for visitors to London and the opulent interior is unashamedly brash and bold.